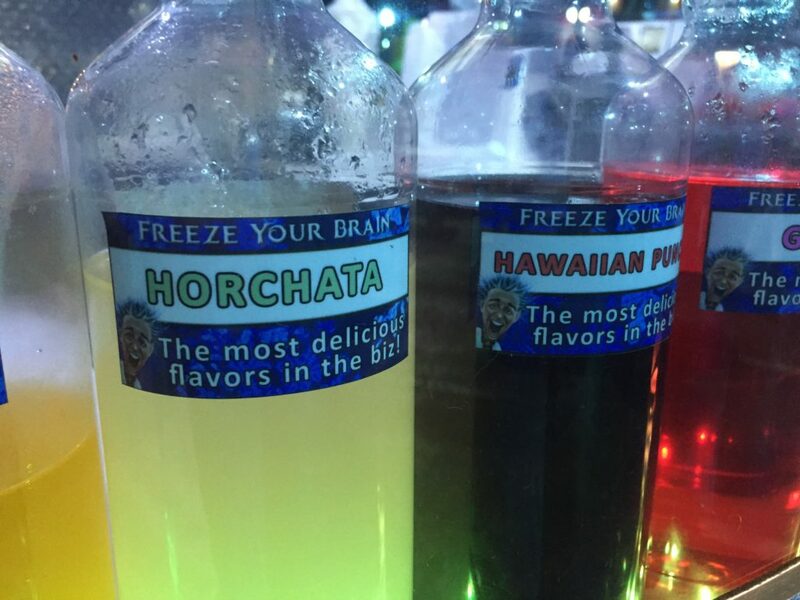 Menu – Welcome to "Freeze Your Brain" Shave Ice! Are you diabetic or just watching your sugar intake? We now offer a Sugar Free w/STEVIA flavor of the day! Just ask about this great new shave ice option at the kiosk. Now you can Warm Your Heart at Freeze Your Brain! and Light Roast Hot Coffee. Perfect for the winter months! 36 Flavors – Made Fresh Daily! w/Blue Bell Vanilla Ice Cream center! Operating hours will vary based on time of the year, tourism, weather, special events, etc. and are subject to change without notice. Check “Upcoming Events” often for most updated event info. Located in the rear parking lot of the Visitors Flea Market, BEHIND Machine Gun America in the World Food Trucks Park.